There are very few dramas which manage to hold your interest for more than 20 weeks but Mein Sitara has done just that and more. The unpredictable twist in Sitara’s story in tonight’s episode came as a complete surprise and will change Sitara’s life forever. Sitara’s conversation with her sister was one of the best scenes in tonight’s episode. Sitara was not sure whether she should keep her baby or not but the fact is that this baby might turn out to be the ray of hope which is missing from Sitara’s life. The arrival of a child will give a different direction to Sitara’s life because she can no longer do what she has been doing till now to earn money. The emotional connection between Sitara and her sister was once again very obvious in tonight’s episode. Sitara’s sister is the only person who loves her and gives her sound advice. Dil tuk tu tum puhanchi hi nahi…haan nazro mein zarur samai thi! Tonight’s episode covered a span of a few months. Khawaja made it very clear that he loved no one but himself which is why Sitara never told him about the pregnancy. He also found someone else who could replace Sitara in his life and eventually decided to divorce her. This whole development was covered very intelligently. The change in Khawaja’s behaviour was shown through the conversations between him and Sitara. Khawaja’s dialogues about what Sitara meant to him and why she didn’t matter any more were beautifully written. They went to show how heartless this man was. Sitara was never the kind of woman who would look for life’s solutions in a relationship with a man if she was that kind of a person Farhad Sethi was the perfect man for her. She has changed considerably in all these years; she is more insecure, less confident and a lot more dependent on others too. Although Sitara said she did not have huge expectations from this marriage but her reaction to everything Khawaja said to her after the nikkah suggested something completely different. He “gifted” her the house in return for a promise that she will keep this relationship secret. This episode also covered Naseem Dil Ruba’s downfall. This was another scene which was very well written and directed. Everything that Khawaja’s assistant said to Nasim suggested that she no longer enjoyed the position she once did in the industry and she did not have close ties with Khawaja’s father now. Mein Sitara is undoubtedly one of the finest dramas of this season. 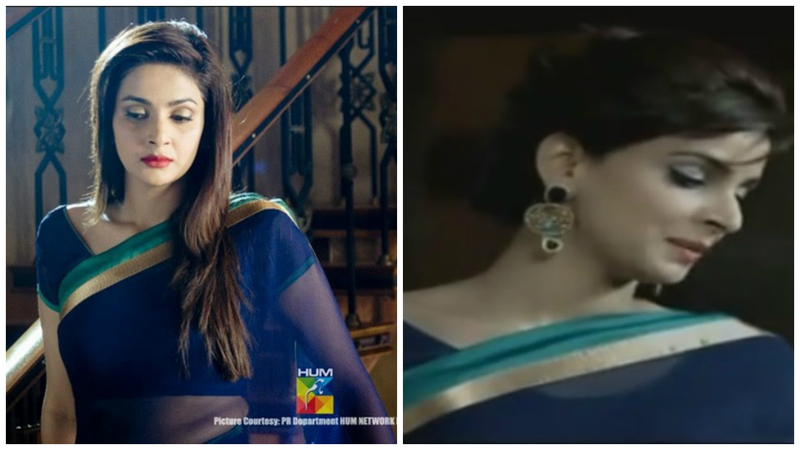 Saba Qamar’s acting was faultless once again in tonight’s episode but she shouldn’t have worn the same blue sari which she wore for the title picture of drama serial Bunty I Love You since that picture has been seen by everyone, even those people who haven’t watched the drama. Saba Qamar’s expressions in this episode were beyond impressive especially when Khawaja says “mohabbat hai mujhe, bilkul mohabbat hai…sirf apne aap se!” Also, in the last scene the expressions of dread and horror on her face were spot on. This episode was packed with powerful scenes right from the get-go. The last scene was just as impactful as the first one. Tonight’s installment started with Sitara’s nikkah and ended with Khawaja divorcing her ruthlessly. This part of Sitara’s life ended with tonight’s episode and from the next episode a new phase of her life will start in which she will be even more willing to make compromises. The preview of the next episode suggested that even after going through so much Sitara is still a fighter! Looking forward to the next installment.